We are fortunate to have the patronage of some incredible individuals. Read how they lend their support and their reasons for getting involved. Jonny was the founding Patron of the charity and lends his support by acting as an ambassador by highlighting the need for A-T research, donating his fees from commercial engagements and providing us with auction prizes. Jonny also selected Action for A-T as a charity partner for his testimonial year. 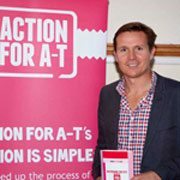 “As a patron for Action for A-T, I would love to raise much needed funds to support the hugely positive goal of trying to make life better for those affected by the condition”. Roger acts in an ambassadorial capacity, helping us raise awareness of the condition and the need for research. He also attends some of our fundraising events and helps us promote our activities via social media and other channels. 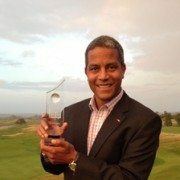 Jeremy regularly donates prizes for the charity to auction and has hosted a number of our golf days. He also helps us by introducing us to potential corporate supporters and by promoting the charity wherever he can. 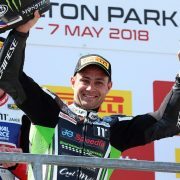 Leon has been an avid supporter of charity work throughout his British and World Superbike Championship career and continues to race for Kawasaki. He hosts an annual golf day for Action for A-T as well as playing in our other days and also donates various auction items and racing experiences. 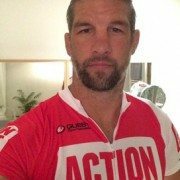 Leon will do all that he can to help raise awareness and funds for Action for A-T whenever his busy racing schedule will allow. Multiple Olympic Gold medal winner Rachel has been a wheelchair user since having her legs amputated after contracting CRPS following an ankle injury on her 17th birthday. 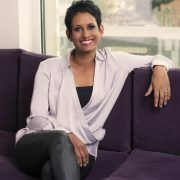 She now dedicates a large proportion of her time to helping children with various disabilities reach their maximum sporting potential. Rachel was a key member of the 2018 Brighton Marathon “Big Push” team, taking part herself and has pledged to do all that she can to help us raise much needed awareness and funds for A-T medical research. Naga has supported Action for A-T since the summer of 2017 when she represented the charity at a City trading day. During this event she met a number of A-T families and as a result, wanted to do more to help. 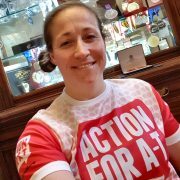 In 2018 she will be leading the Action for A-T team at the Prudential RideLondon Surrey 100 cycling event as well as taking on a 3 day ride from Bedford to Paris. She can also be found on the fairways at various Action for A-T Golf Days as well as attending and hosting some of our social events. Simon led the Action for A-T team in the 2015 Prudential RideLondon Surrey 100 cycling event raising a significant amount for vital A-T research. He also supports the charity by staging events in aid of Action for A-T via his own event company, Set Piece Events, and hosted our golf day in 2015.